Everyone loves before and after pictures. Indeed, there is something particularly beautiful about the process of transformation. Here are a few amazing before and after kitchen renovation photos from some of the most popular home makeover shows on television. This kitchen doesn’t even look like the same kitchen. It received more than a facelift – it was moved to an entirely different room, i.e. the living room! Featured on Love or List It, the before photos show a small and cramped kitchen, while the after pictures show how the kitchen renovation services turned the kitchen into an open concept space. The island is exceptionally long and makes for a beautiful addition to the room. This kitchen makeover was featured on HGTV’s Fixer Upper, hosted by Chip and Joanna Gaines. The house was complete with mouse droppings and trash! The kitchen received a major facelift and was transformed into a beautifully bright, modern kitchen. What’s particularly appealing about the kitchen is that it went from dark and dingy to beaming with sunlight due to the addition of a second window. The wood floors and handmade wooden island beautifully complement the white cabinets. 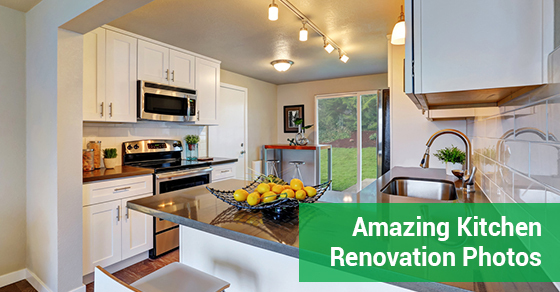 These pictures perfectly illustrate the power of kitchen renovation services. This makeover was featured on HGTV’s Buying and Selling. At first glance, you may not notice anything terribly wrong with the before picture. It’s the after picture that really shows how even small additions can completely transform your kitchen, which is why we’ve included it on this list. It’s a much more realistic approach for the average homeowner. Indeed, even small changes such as updating your kitchen faucets can add value to your home. In this case, the addition of the backsplash completely transformed the kitchen, adding texture, depth and interest. For our last kitchen makeover picture, we went with something that is completely doable for the average homeowner – this makeover didn’t have a television budget. In fact, their budget was on the modest side, and no demolition was necessary. The kitchen doesn’t look the same at all, even though the makeover only involved coat of paint on the kitchen cabinets and a new and improved (and extended) countertop. If you want to increase the value of your home with kitchen renovation services, contact our team of experts at Brothers Plumbing today. We have over 50 years in the industry and offer affordable rates.